A few short years ago I decided to start playing with QRP and purchased an HW-8. Since this is a CW only radio I brushed up on my code using software called RufzXP until I was confident to have that first CW QSO in over 20 years. Although reading code at 15WPM went well I sure had QLF (Sending with the left foot) missing or hitting extra dah’s and dit’s with an IAMBIC keyer. It was even worse on a straight key! So in searching for a training tool I ran across the DK3LJ YACK keyer project and discovered it’s ability to be used to help train my IAMBIC fist. The only down side was the typical piezo buzzer / square wave oscillator…. that buzz buzz sound I can’t stand. Last fall (2013) someone on the QRP-L mailing list mentioned wanting a nice sounding code practice oscillator. That is when I decided to combine a twin-T oscillator into the YACK keyer. 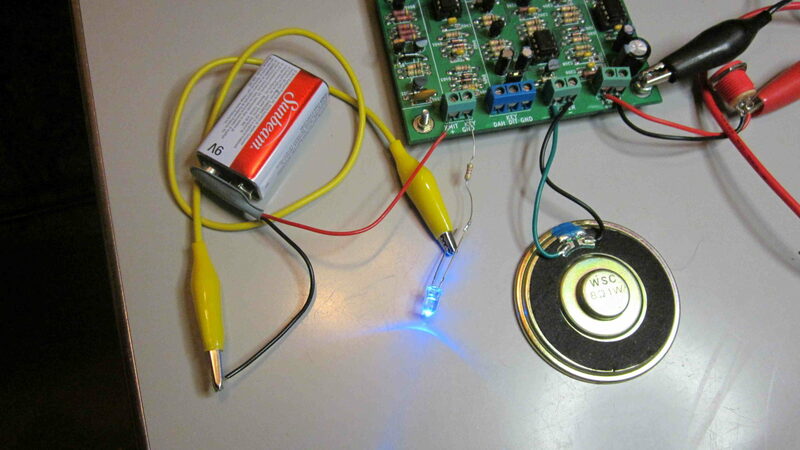 The result is a nice little keyer IC with well shaped CW audio. A few extra goodies were added like reverse power protection, protection of the keyer inputs (every accidentally plug your -65V grid key rig into the key jack and watch the magic smoke? ), and of course the ability to use either positive keying (for modern day equipment) or negative grid keying (for my TS-520 & 530). To add icing on the cake the controls are mounted to a second PC board to make chassis mounting easier and cleaner. 3CPO kits are available in the store! Don’t need the horsepower of 3CPO? Check out our Mini-Yack. Manual and schematics (v2): 3CPO-Manual. CALF Coral Enclosures with overlays are available in the store! A resistor – The value is not critical but something in the range of 2.2 to 10K. 4.7K is a good medium value. 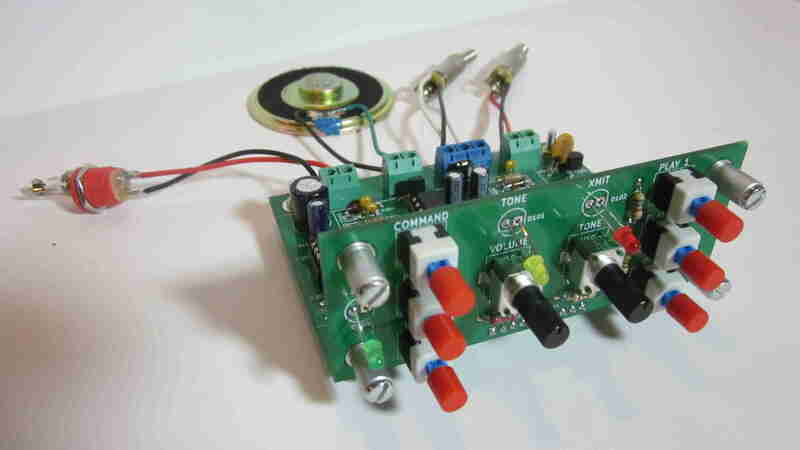 An isolated power source, such as a 9V battery. Wire the circuit below. Connecting P1 and P2 should make the LED light. Connect P1 (Battery +) to the XMIT KEY+ and P2 (resistor free end) to XMIT GND. The LED should light as you key down. Negative grid block keying test – Swap the XMIT KEY+/GND connections. The LED should still light during key down.